If I can’t have My Reproductive Rights, then it’s not My Revolution. A lil bit about #repealthe8th not just being a woman’s issue. We live in a post gender recognition Ireland, I always mention this when speaking at events. It has even caused my opponents to edit their language & acknowledge this. This happened with Mrs Caroline Simmons of the Pro Life Campaign when we were speaker at a debate in NUIG. I have been very, very fortunate to have people in my life who happen to be trans, who took the time to talk to me. To explain & at times correct me when I assumed or screwed up. I sure as hell don’t always get it right, I try. I know I fecked up already this year and me being not sober & it being 3am didn’t excuse it. I have always tried to include non cis people when I talk about reproductive rights, because its the least I can do, to maybe make the world a lil less tough. Recently they have come out to friends and family as being a bloke. I am so happy for him. He can get on with living his life as his real self. I am very aware the the 8th still effects him, same as it does me, but accessing healthcare for him, especially if he should need to travel will be a bit more complicated. I still love him dearly that was never going to change, & he’s thanked me for being as inclusive as i have been & how some of the conversation I have had with extended family help him. Being inclusive was always important to me, but now more then ever I am grateful for all the times I have said pregnant person or people who can become pregnant. And I am going to keep saying it, because it is important, esp when all of the mainstream messaging is currently women & girls. At the #Marches4choice @freesafelegal have had trans people speaking, @freesafelegal also worked with @TENI_Tweets when formulating how to talk about abortion & not be utterly woman centric. Yes the Abortion Rights Campaign got abuse from some ‘feminists’ for doing so, I have gotten it too, but now more then ever I am glad to be a ‘bad’ feminist saying pregnant people, cos now it’s close to home & family. I don’t know of we will see any main stream campaign messages re non cis people, but I still support ye and wont stop saying pregnant people. We work to ensure we have enough Yes Votes on the 25th of May so that we Repeal the 8th Amendment for everyone so we can all access the healthcare we need. Launch of Roscommon For Yes! I hopped on the bus down to Strokestown for the launch of Roscommon Together For Yes, it’s one I have done a few times to Strokestown it’s not even a 3 hour trip which is always nice to sit and read and relax for. 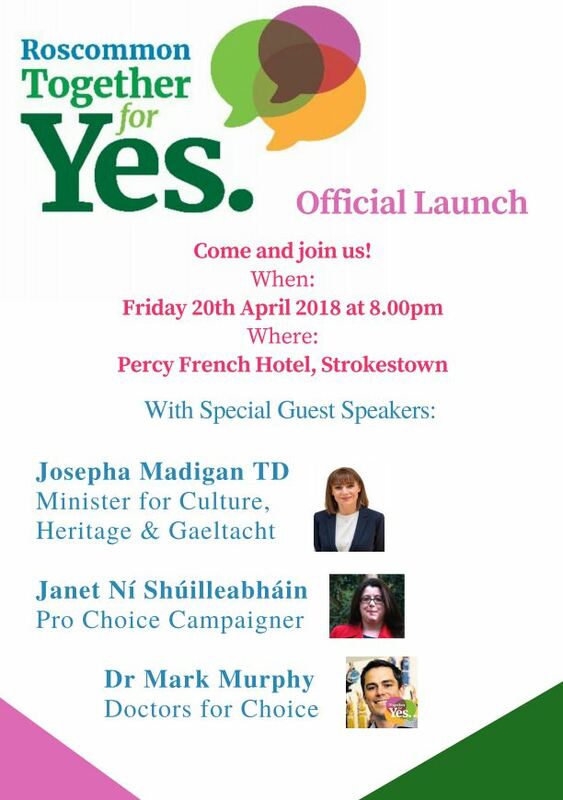 I was still invited down to attend the launch and to meet the members of Roscommon Together For Yes, who had been Ros for Choice part of the Abortion Rights Campaign region groups before they re branded for the referendum. I meet up with them in the bar of the Percy French Hotel were the event was on later. We chatted about posters, the campaign, how they hoped the launch would mean more people would sign up to canvass, about when posters would be up and the add they placed in the local paper about the event. They were delighted to find out I have been a frequent visitor to Strokestown. There were exhibitions in the room as well, one was this amazing display of 20 shoes, one for every person we know traveled to the UK to have an abortion in 2016. Which was set up by an amazing Rocommon native who also founded Voices for Choice Choir. Everyday stories is an exhibition which is currently traveling and if any group wants to host it please get in touch with them. There is also a discussion workshop which can be sent out to people to run. Any groups or individuals may host an event. Workshops have been held in cafés, pubs and living rooms – whatever space you feel comfortable in. A phone + internet / mp3 player is required to play the audio. A speaker is recommended if your group is larger than 4 people. Please get in touch if you would like to host an event. The speakers at the Roscommon Together For Yes were wonderful. The Minsters Speech was powerful, I still get very moved when TDs and Minsters speak about the Harm the 8th Amendment causes and how we need to remove it for compassionate healthcare here in Ireland. It is so wonderful that so many of them are on board and echoing what we have been saying for the last 6 or so years. Nurse Polly spoke about how she can not do her job and how legally there are things which she can do to a pregnant person while they are giving birth with out their consent that in any other context would be assault and how this has to change and how she wants to be able to care for all her patients. Tracey from Terminations for Medical Reasons spoke about being are parent with 3 children already who had deal with a fourth pregnancy which ended tragically after a diagnosis of a Fatal Featal abnormality. How she and her husband had thought naively after the diagnosis was confirmed that she would be induced here at home. Instead she has to take on trying to get an appointment in Liverpool women’s hospital and make all the travel arrangements which took weeks, all the while people were asking the types of questions they do, about when are you due, are you hoping for a boy or a girl, are your other kids excited to get a new baby. She spoke of the compassion, dignity and care she experienced there and how that was lacking here due to the 8th amendment. The we hear from Dr Mark Murphy who explained what a medical abortion with pills is like, how drs and all medical staff will be able to opt out of providing abortion services same as they do with contraceptive services using the conscience clause. That no form of contraceptive is 100% and even when people are doing all they should do, unplanned pregnancies can still happen, drs deal with this everyday and most of the people who have an abortion are already parents. I want to give a special thanks to Nurse Polly stepped up to be a speaker at the launch when I had to step down. I have no doubt we will be sharing a platform soon at other meetings around the country. The Welcome I got in Roscommon was wonderful and if there is time over the next 5 weeks I will absolutely be back, maybe to do something in the north of the county. Again thanks to all those who supported my gofundme which made this possible. Strokestown, abortion stigma and me. Novemember 2012, nearly 6 years ago, was the first time I came to stay in Strokestown, Co. Roscommon. I had passed through it before on the bus out to stay with friends in Balllina. I know I am that strange Dublin person who actually travels outside of the Pale. My friend Lora O’Brien had asked me to come and be a speaker at a two day Goddess conference in the Visitor centre in Tlusk. where she was the manager. I had agreed to do this before the death of Savita had broken and that Saturday I was in Strokestown and not attending one of the vigils and Marches which sprung up all over the country. I knew how many there were as I was at the time the sole admin for the Irish Choice Networks website and I kept updating the list there and on the ICN facebook page. I kept my speaking commitment and on the way down in the car I got talking with friends about abortion and about what had happened to Savita, about the law here and about the restrictions the 8th Amendment put in place. When we arrive into Lora’s the conversation continued after she had welcomed us and made us tea. She said that she didn’t think things were going to change as abortion wasn’t really such a common thing, as sure none of her friends had had an abortion. I looked at her and smiled and said “Hi I am one of your friends and I have had an abortion”. That was the first of many, many conversations I was to have with friends over the coming months. While the vast majority of my friends knew I was very prochoice, I still hadn’t disclosed that I myself had travelled. From November through to the end of January 2013 I told more of my friends, I had those conversations. I am blessed they were so supportive, and so at the meeting at which the name of the Abortion Rights Campaign was announced, I publically stated for the first time in person to a room of mostly strangers that “I had an abortion”. This all started in Strokestown, which I came back to visit frequently, even spending summer holidays here with my children and celebrating Winter solstice and Summer solstice with friends and family. And here I am again in Strokestown, today as Roscommon For Yes launches as we finally have a referendum to Repeal the 8th Amendment. When I said I would travel to as many counties as possible I contacted a range of groups and let the schedule evolve as it would. And so the first place I find myself invited to is Strokestown. Its funny but for me personally not surprising as this place is for me connected with the Goddess I have the deepest connection with that of the Great Queen also know as An Mór-Ríoghain or The Morrigan. The Warrior Queen, the Battle Crow, the Goddess of Sovereignty. And that is what we have been fighting for the rights of sovereignty over our own bodies. The last few years haven’t been easy, hell the last few months have not been easy, but I know She has had my back. So I am happy to make this pilgrimage here. I have always smiled when some have called me the Witch involved with the abortion rights campaign, yes I am a pagan, I have never hidden it. I spoke about it on the @Ireland account at the start of the week when I was a curator, Lora did too. There are as many pagans in Ireland as there are Jewish people according to the last census, we are people just like everyone else, who’s spiritual life, helps us through the hard time and helps us celebrate the good times. So I am delighted and honoured to be here in Strokestown today. Thank you to those who donated to my Fundme who made this trip and blog post possible. Countries which make abortion legal & bring in free contraception always see abortion rates drop. Right now we have no idea what the complete abortion rates for people living in Ireland is. This is due to a number of factors. Not everyone who travels to the UK gives an Irish address, some will give the UK address of a friend or family member. Some people travel to The Netherlands & again don’t give an Irish address but a friends or family members address. Some travel to other countries but only the UK & the Netherlands report back stats of those who gave an Irish address. Both @WomenHelpOrg & @abortionpil have given stats about the number of people who contact them, but again we don’t know how many are actually using the abortion pills. Some people may order them and then choose not to take them as they have had a change or circumstance. Anytime you hear/read statements about increased abortion rates, remember we only have a guestiment of current numbers. But we do know, as in Switzerland making abortion legal + free contraception = low rates of abortion. And free contraceptive services for anyone who needs them was recommended by the Joint Oirteachtas Committee and is part of the plans Simon Harris as Minister for Health will be putting in place. So after we Vote Yes on the 25th of May we need to let the Minister and our TDs know we support Free contraceptive services for everyone. This is one of the posts created with the support of my go fund me campaign. Offaly on the 3rd of May! 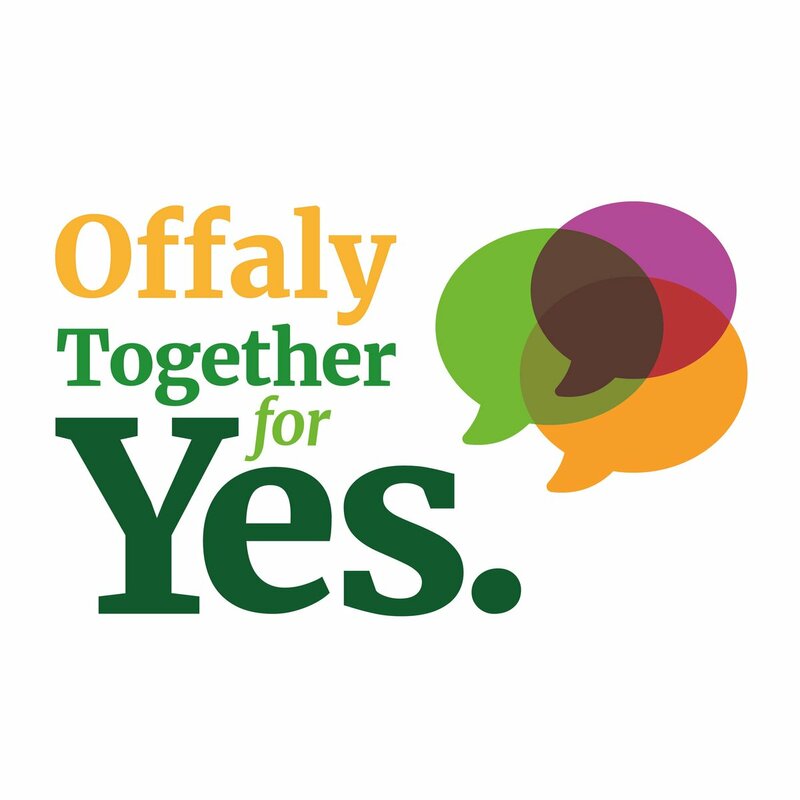 I have been invited by Offlay Together for Yes to Tullamore on Thursday evening, the 3rd of May, more details to come. 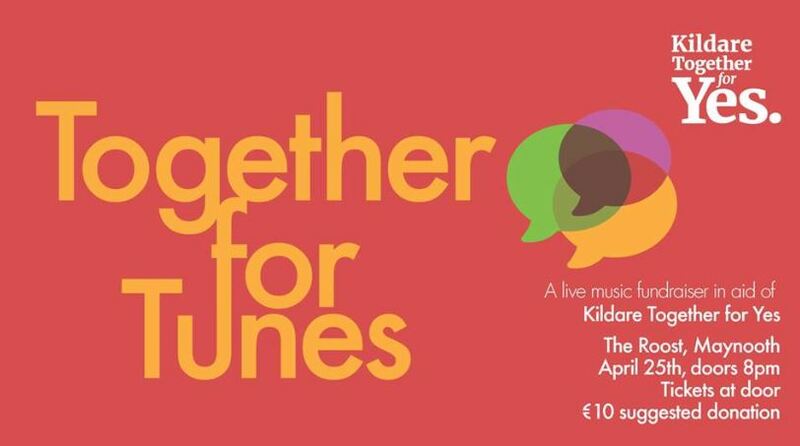 I have been invited to Together for Tunes by Maynooth Together for Yes taking place April 25th in The Roost. Abortion stigma damaging to the mental health of those who have had an abortion and those who may have an abortion. The research has been published in the journal Psychology of Women Quarterly and is available online on UL’s institutional repository. Dr O’Donnell and her team, investigated whether the health issues that related to stigma also applied to the stigma surrounding abortion. The team focused particularly on Ireland, using online surveys to gather information from women who had had abortions about their feelings of stigmatisation and other mental and physical health symptoms. “In Ireland, no one can escape the knowledge that abortion is stigmatised in our society, and this includes women who access abortion services,” Dr O’Donnell says. As her team’s research has found very real health problems associated with stigmatisation Dr O’Donnell believes that it is incumbent on all citizens to reduce stigmatisation of those who have had abortions. 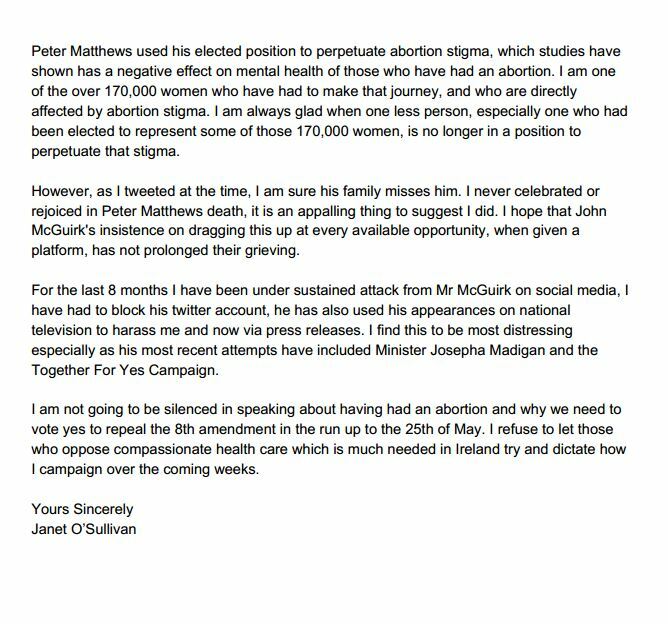 Abortion stigma is real and unfortunately we are being bombarded with it currently, by the Vote No sides of the the referendum campaign. Abortion stigma effected my well being and it if effect the well being of people all over Ireland, the sooner it is considered a harmful relic by us all the better it will be.